Pumpkin is a crop of commercial importance grown in West Africa. Nigeria, Ghana and Sierra Leone are the major producers of the plant. Fluted Pumpkin is majorly cultivated for its leaves and eaten as potherb. The seeds can be eaten whole by boiling and more foten used to lace several soup including egusi soup. It is called Ugu in Igboland, Iroko in Yorubaland and Umeke in Edo. 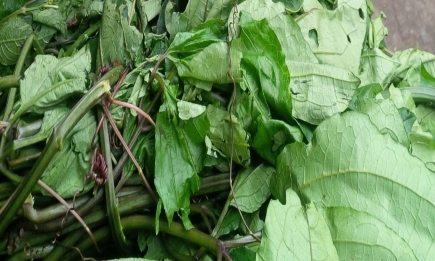 Only recently, new products are being discovered and after processing, products like Ugwu tablets,drinks and chips are being manufactured for health purposes. The seed is planted one foot apart by turning the exposed part of the seed upward and the other side in the soil. it needs air, free movement, enough space and enough water. It should be staked into a framework of bamboo or make a shelf for it to climb on when twining. It germinates after ten days. After first harvest, as a multi harvest crop, it can be harvested later every 4-5 weeks and a minimum of 4 times. After land preparation, we would send a schedule with a time line of activities of what would be happening on your own particular farm to you. Ugwu may also be interplanted with other drops like yam or cassava in which it uses their stakes for support. © 2018 Grow Crops Online, All rights reserved.